Multiplayer gamers now have one less reason to buy Halo: CE Anniversary. 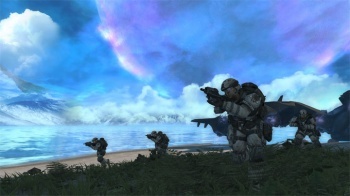 Microsoft has announced that the multiplayer maps due to ship with next week's Halo: CE Anniversary (a high-def remake of the original Halo) will also be released as DLC for 2010's Halo: Reach. The "Anniversary Map Pack" will include six multiplayer stages-Battle Canyon, Breakneck, High Noon, Penance, Ridgeline and Solitary-plus Installation 04, as a Firefight map, for 1200 Microsoft Points ($15). It will be available Nov. 15, with the release of Halo: Anniversary. Good news for Reach owners who weren't keen on the idea of shelling out $40 for Anniversary, I suppose, but does this strike anyone else as a bewilderingly generous move on Microsoft's part? It seems to me that either the company is super confident that Anniversary can sell purely based on gamers' collective nostalgia for the original Halo's singleplayer game, or is hedging its bets by cannibalizing Anniversary's multiplayer content as Reach DLC in an effort to recoup development costs. Granted, we don't have exact details on how the DLC versions of these maps might differ from their disc-based counterparts, and for all I know this might just be a clever way to ensure that the two games' multiplayer communities can interact with one another (thus creating one giant "supercommunity"), but either way this is a confusing move. I guess we won't truly know how this situation works out until November 15. In the mean time, what do you think? Have any of you just lost interest in buying Anniversary? Do the multiplayer maps matter to you? How many of you are just in it for that insanely overpowered pistol?